Factory tests of 10VS15 mine car and its softstarter. 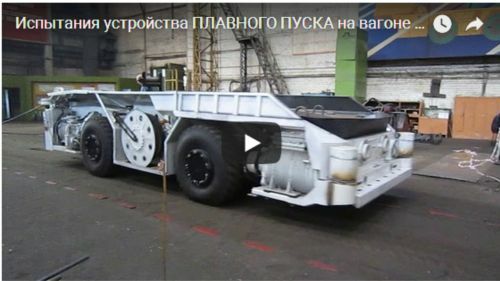 Factory tests of the mine car softstarter that took place in the assembling department of Rudgormash under an acute supervision of the Chief engineer Zarudnev V.V. ended in success. Presently, the application of the softstarter is a mandatory requirement of all underground mines where mine cars are used. Lately, the construction of Rudgormash mine cars has changed greatly in accordance with the requirements and desires of the mining companies. the car has a cable drum with an automatic winding. The scrap tires are super hard – with 32 layers of and have the carrying capacity of 10 tons. The car design conforms to all latest standards (2017), that are regulated by the technical supervisory state authorities according to the Russian standard GOST 55163. Over the recent years the mine cars are widely used in underground mines of Kuzbass during development works. We have also modified our mine cars for proper and more comfortable operation in coal mines.